This was my class schedule. I put this at the back of my school ID because I hardly remember the place and time of our class! I also put some positive words that I need throughout the day so that I will be highly motivated to do my best. Also, hoping that these adjectives would also attract positive stuffs. I read this most of the time as a reminder. The last one, i am a YSM, is the highlight among the other characteristics I need to possess. YSM is self-made acronym and I won’t tell its meaning to anyone. 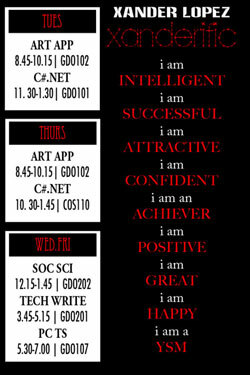 This entry was posted in Daily Me and tagged class, creative, schedule. Bookmark the permalink.